The Executive Committee of AIFF met at Constitution Club, New Delhi today to discuss various issues pertaining to Indian Football. 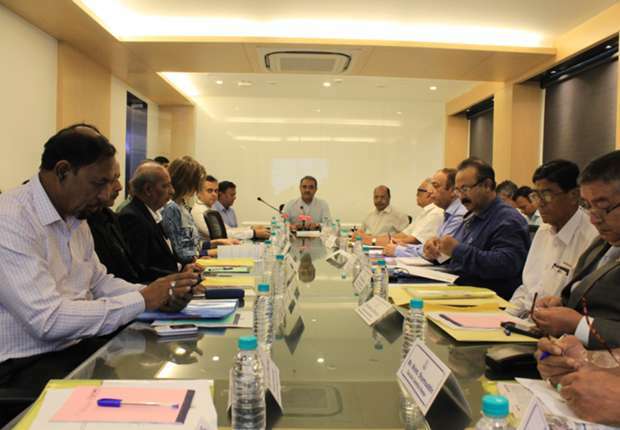 The meeting was chaired by AIFF President, Praful Patel. Besides, AIFF General Secretary Mr. Kushal Das; Vice Presidents Mr. Subrata Dutta, Mr. KMI Mather, Mr. Shrinivas Dempo, Mr. Subhash Chopra, Mr. Larsing Ming; Treasurer Mr. ZA Thakur; Ms. Sara Pilot; and all other members except Mr. AR Khaleel and Mr. Jesiah Villavarayar attended the Meeting. AIFF Technical Director Mr. Scott O’Donnell, Mr. Bhaichung Bhutia, Chairman, Technical Committee, AIFF; Mr. Javier Ceppi, Tournament Director, FIFA U-17 World Cup India 2017 and Mr. Joy Bhattacharya, Project Director, FIFA U-17 World Cup India 2017 were also present on the occasion. Mr. Chirag Tanna and Mr. Rochak Langer representing FSDL attended the Meeting. The draft for the proposed restructuring of League System was put forward to the Ex-Comm members along with suggestions of I-League and 2nd Division clubs. The members of Ex-Comm have been asked to put forward their suggestions, which will be discussed on a later date. The Committee was apprised about the approval of the participation of 40 odd Teams in the U-18 League (post inspections). This is a significant increase as in 2015-16, there was a participation of 28 Teams in the League. Besides, the U-16 Youth League has also witnessed a massive increase in Teams. While in 2015-16, 39 Teams had participated, the forthcoming edition will see over 50 Teams battling for the top honours. The first edition of the U-13 League is scheduled to kick-off in 2017-18 season. The Committee also ratified the proposal of providing a time span of one year to 2nd division Clubs to complete their I-League Club licensing criteria instead of the prevailing three-month span. The fee of the Central Registration system (CRS) was reduced from Rs. 15000 to Rs. 5000 for foreign Players and to Rs. 5000 to Rs. 2000 for Indian Players. In addition, Women Players playing in the proposed Women’s League will have to pay a CRS fee of Rs. 1000 while all other Women Players need to play an amount of Rs. 100. A new logo for AIFF was also presented before the committee and was approved. The new logo will be launched at a later date.